​Founded in 2003, Ledyard Education Advancement Foundation (LEAF) is a non-profit, non-partisan, tax-exempt organization. LEAF solicits donations from individuals, businesses, foundations, and organizations. LEAF disburses grants to Ledyard Public School teachers for targeted programs that promote excellence and enhance student achievement. LEAF grants encourage creativity and innovation. ​ LEAF has distributed over $600,000 in grants since 2003. ​that promote excellence and enhance student achievement in Ledyard Public Schools. This project entails providing a class set of ukuleles for each music room and integrating new units of music education using the ukuleles with our current music curriculum. The new, expanded curriculum will augment the students’ understanding of music development, enhance their appreciation and enjoyment of music, and help them develop new skills and gain confidence. Do you ever wish you could donate directly to support a teacher's innovative, creative idea for their classroom? Here is your chance! Click here to see a list of great teachers and their ideas! Then make a tax deductible donation to directly support that teacher and their idea. Our middle school students now have access to Project Lead the Way - Automation and Robotics. 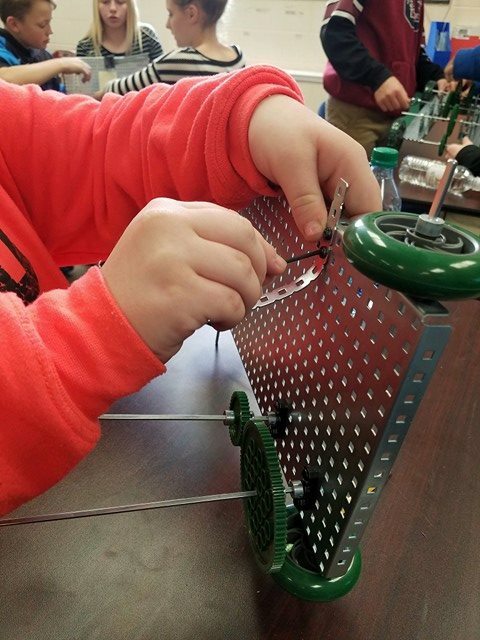 Using the Vex Robotics platform, students are exploring mechanical systems, energy transfer, machine automation, and computer control systems, and they are applying this knowledge to real life problems.